Artist's illustration showing the planned Stratolaunch system, which will launch satellites using a rocket carried into the sky by a giant airplane. Vulcan Aerospace continues to assemble the world's largest aircraft at the Mojave Air & Space Port in California, but its builders are remaining mum about the Stratolaunch project's biggest mystery: What rocket will the air-launch system carry aloft to place satellites into orbit? At the 32nd Space Symposium in Colorado Springs earlier this month, Stratolaunch Executive Director Chuck Beames said he could not talk about the launch vehicle strategy yet, but he promised a series of announcements over the next year about the program and the company's "NextSpace" vision. Company officials said they expect to begin commercial operations within four years. "Stratolaunch is making good progress, and remains on target to meet our long-term goal of being fully in service by end of decade," said Steve Lombardi, manager of corporate communications for Vulcan Inc. "I don't have anything more specific to share now, but we'll have more news in the near future." Stratolaunch was announced in December 2011 as a collaboration between Microsoft co-founder Paul Allen and Scaled Composites founder Burt Rutan, who had teamed up to win the $10 million Ansari X Prize with SpaceShipOne in 2004. Partners in the company included Vulcan, Scaled Composites, Dynetics and SpaceX. Since that announcement, the company has suffered several delays in building the medium-class launch vehicle. SpaceX, which was adapting Falcon 9 technology for air launches, withdrew from the program in 2012. "SpaceX was a partner, and like a lot of partnerships, it was just determined that it was best we went our separate ways — different ambitions," Beames told Spaceflight Insider in 2015. "We were interested in their engines, but Elon and his team, they're about going to Mars, and we're just in a different place, and so I think it was a parting of the ways that was amicable." Stratolaunch then contracted out its rocket work to Orbital Sciences Corp. (now Orbital ATK). The company also contracted with Aerojet Rocketdyne for six RL10C-1 rocket engines with an option for six more for use in the launch vehicle's third stage. The agreement with Orbital ended without the production of a launch vehicle, with Beames saying the rocket was not economical. Stratolaunch officials said they were reassessing the project in light of the shift in the market recently toward smaller satellites. In 2015, Beames said that Stratolaunch was examining more than 70 launch vehicles for use with the Stratolaunch aircraft. He indicated that the company might use multiple launch vehicles to serve different payload classes. Beames said the company would announce its launch vehicle strategy in fall 2015, but that time came and went with no announcement. 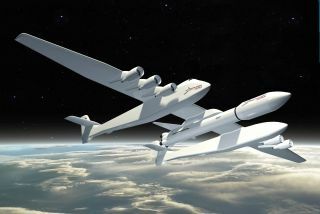 Stratolaunch has long-term plans to launch crewed spacecraft. Sierra Nevada Corp. has designed a scaled-down version of its Dream Chaser space plane that would be launched aboard a rocket from the carrier aircraft. However, that vehicle was designed for Orbital's launch vehicle, which did not go forward. Beames said in 2015 that work on accommodating Dream Chaser had been put on hold due to uncertainty over the launch vehicle to be used in the program.